In its heyday, the mill processed more than $14 million worth of gold and silver in 25 years. 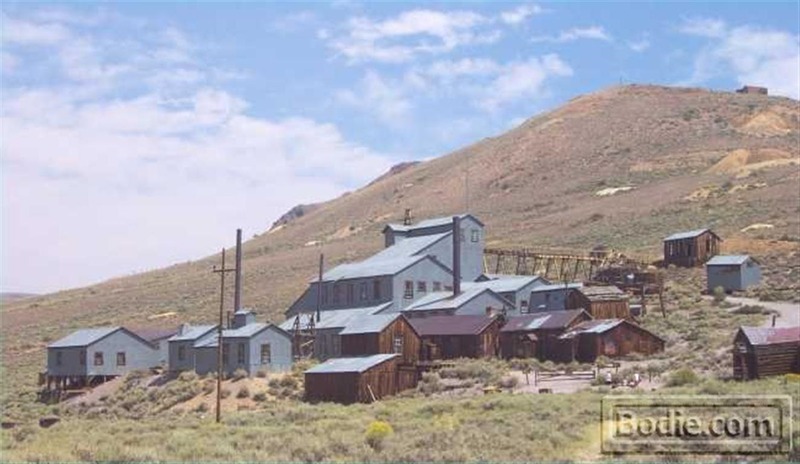 In 1898 the original mill burned down (it was built of mostly wood, while this one is framed in wood, but mostly covered with sheets of corrugated steel,) but was rebuilt by the following year. In the enlarged 2001 picture of the mill (above,) you can barely see a pole at the top of the hill. It is from that point on the hill, that Andrew Halliday designed and built an ingenious gondola system was used to carry ore from the mine to the mill. This saved dozens of horses and men literally hours worth of work for each load of ore that was to be delivered to the mill for processing. Gondolas would be loaded at the top of the hill, and run down a “never ending cable” to the mill, where the bottom would automatically opened to drop the ore out. Another interesting note – according to state experts, this mill is the “most in tact” mill in California! The Occidental Hotel - before the fire - and the Johl house - now located directly across the street. A RARE 1890's photo of Bodie with the first Standard Stamp Mill, before it burned down in 1898. www.Bodie.com/History/Tour/Mill.asp — at Bodie. This is a view of the stamp batteries from the back side. Clearly visible is the camshaft, the cams and the tappets (the large cylinders that look like spools) for each stamp. The power wheel at the far left would have a large belt around it, turning the entire shaft. Close up of two stamp batteries in the Standard Mill. This is a view of the stamp batteries from the back side. Clearly visible is the cam shaft, the cams and the tappets (the large cylinders that look like spools) for each stamp. The power wheel at the far left would have a large belt around it, turning the entire shaft.